– for mild thematic elements. Film Review Thanks to the success of Frozen, Disney’s animated musicals are back on top. Earlier in 2016, Disney’s animation team released Zootopia, which would go on to win the Academy Award for Best Animated Picture just a week ago, topping Pixar’s own Finding Dory, as well as Disney’s second, non-Pixar, animated film last year, Moana. Moana brings Aladdin directors Ron Clements & John Musker back together to deliver a story inspired by the ancient beliefs of the Polynesian islanders. The story centers around a teenage girl who ventures out into the ocean to find a demigod named Maui who is responsible for the decline of the health of nature on her island. It’s a mystical story filled with magic and some New Age tones that may make some viewers uncomfortable. Although rooted in many of the Polynesians’ own beliefs, Moana has the feel of a fantasy story. While little, Moana interacts with the ocean as if it were a living creature. It has a bit of a moment right out of The Abyss at the beginning of the film where it rises up in a snake-like blob to meet Moana. Her grandmother, who is one of the film’s most fun characters, also talks of being reincarnated and coming back after she dies as a manta ray. The demigod, Maui, is attributed with giving mankind everything they’ve ever been blessed with (which culminates in what is arguably the film’s best song, “You’re Welcome”), and when he wields a magical “hook,” he can shapeshift into various animals. There’s even an “underworld” ruled by various monsters and a vicious lava monster that is a sort of nemesis for Maui. Again, elements of the environmentalism in their culture, like treating the ocean as a being, or reincarnation, will be off-putting to some. Still, the film presents it borderline as a made-up fantasy that makes it feel less serious or tangible. But the fact that it stems from a culture’s real belief system make it a little less so. Spiritualism aside, the movie is an excellent animated feature. Newcomer Auli’i Cravalho makes her debut as the title character and she has an amazing voice to boot. Dwayne “The Rock” Johnson is wonderful as Maui, and it’s surprising how good his voice is for the song “You’re Welcome.” Comedian Jemaine Clement is quite good as a huge crab who even sings a song in the style of Clement’s musical outfit, Flight of the Concords, and Rachel House is fantastic as Gramma Tala. It’d be criminal not to mention Heihei, the mindless chicken that tags along with Moana on her journey. He offers some of the films biggest laughs. The story is a fun “road” film set on the water, drawing some similarities to The Emperor’s New Groove in the process (the shapeshifting, journey, unlikely and reluctant pairing, and a few other little things). The songs are pretty good, too, although not all of them leave an impact. Most of them are a bit forgettable even, but not in necessarily a bad way. And that animation… wow! With each film Pixar and Disney release, they seem to outdo themselves. The special features with this release delve into how they created brand new software to tackle the complexities with animating water and hair. We also watched the film in 3D at home and it really brought added clarity, detail and depth to the visuals. It’s quite a marvel! The story offers a lot of originality by way of the details, but there are also some of the staple plot elements and themes that you’d expect from a Disney film like this. There’s even a slight twist at the end that some viewers won’t see coming. The predictability at times is forgivable, but it does tend to steal away the impact some of those moments are meant to have. The content is definitely of the PG variety. There’s one moment where Moana says “You son of a–” to Maui and doesn’t finish the statement. That was a little surprising to hear in a movie like this, though. There’s some violence when Maui and Moana come in contact with several ships full of a tribe of coconut creatures. They shoot spears and blow darts at our heroes, who fight back by swatting them around. A huge crab threatens to eat a person, and several scenes involve battling with a lava monster that has a humanoid form with glowing yellow eyes. It throws balls of lava at them, too. Nothing is exceptionally violent or out of the ordinary, however. An elderly character does die of seemingly old age in one scene, and a flashback shows the chief swimming after a friend who is sinking in the ocean and we learn that they had died. Overall, Moana is an excellent Disney animated effort. Some of the spiritual or mystical content is worth being wary of when showing it to the young, impressionable ones, but there’s a good chance that its fantastical presentation will make it a little less serious at the same time. While it may not be the best Disney has produced by way of animated features (I do agree with Zootopia‘s Oscar win over this one), if nothing else, it’s another significant step in the right direction regarding the achievements in computer animation technology. Fans of animation especially shouldn’t miss this one. 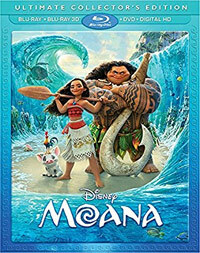 Blu-Ray Bonus Features ReviewMoana makes its debut in a 3D Blu-Ray/2D Blu-Ray/DVD/Digital HD combo pack, in a Blu-Ray/DVD/Digital HD combo pack, and on a single-disc DVD. It also released to digital providers two weeks early.Moana 3D – The gorgeous animation in the film is perfect for the 3D format. Everything from the ash surrounding the lava monster to things flying at the screen or Maui and Moana climbing a mountain are excellent uses of the format. The clarity is simply perfect, too, and it’s just a marvelous spectacle presented in the third dimension. Inner Workings (6:26) – The animated short cartoon that showed in theaters before Moana is available to watch in 3D on the 3D disc or in 2D on the normal Blu-Ray disc. It’s a cute Inside Out-ish story that shows a man who’s basically a worker drone in an office, pushing buttons all day, and his brain and heart are organs that try to direct him in different ways (including his bladder). It’s cute but also a pretty serious statement about an office work environment and learning how to still live your life to the fullest in spite of those responsibilities. Maui Mini-Movie: Gone Fishing (2:28) is a short little new cartoon that shows Maui struggling to fish while Moana looks on and laughs. It’s pretty short and, admittedly, nothing all that special (You would think Maui would be more adept at fishing having been on an island for 1,000 years!). Island Fashion (5:12) features the film’s costume designer talking about the different looks the characters sport during the film. They Know the Way: Making the Music of Moana (12:37) – The music in the movie was a collaboration of composer Mark Mancina (Twister) and Lin-Manuel Miranda (Hamilton) and Opetaia Foa’i. We get to hear from them as they talk about their process and see some footage of them working on songs together in the studio. We also see some great footage of the actors getting involved and singing while recording in the studio. Things You Didn’t Know About… – There are two of these featurettes. The first one (2:01) quizzes the directors and Dwayne and Auli’i about their favorites foods, how many hours they sleep, their favorite animals, etc. The second one (1:57) interviews the songwriters about what they had for breakfast, favorite Disneyland ride, favorite Disney song, how much sleep they get, favorite instruments, what animal they’d like to be able change into if they could, and advice for aspiring musicians. The Elements of: is a 4-part section about what it took to make “Mini Maui” (3:34) and animating “Water” (4:38), “Lava” (2:55) and “Hair” (3:04). The most interesting part is how they were reunited with the animator for the character of Genie in Aladdin to create hand-drawn animation for the “Mini Maui” character. They also talk about creating their own program called “Splash” to make the water, the challenges of animating lava with all of its different traits, and creating new software to make the fluffy hair for Maui and Moana. Deleted Scenes with Intros (26:01) – There are several deleted sequences shown in storyboard form with introductions from the two directors and scratch vocals instead of the real actors. They include: Moana learning the dangers of the ocean at a young age, a boat race sequence with Moana having had 6 older brothers (which was omitted from the plot), younger Moana who meets the piglet Pua, Gramma Tala teaching her more things, Moana overhearing an argument between Gramma Tala and her father about Moana’s future, an alternate introduction of Moana’s character, and Maui in the underworld resuscitating Mini Maui before encountering 8-eyed bats! None of these scenes feel as though they should have been left in the film, however. Fishing for Easter Eggs (2:34) is a great little featurette about the Easter Eggs referencing other Disney movies hidden in Moana. It includes Baymax painted on one of the little coconut villains, Flounder on a village painting, the Aladdin carpet, and much more! Two versions of “How Far I’ll Go” are included, one performed by Alessia Cara (3:04), and one performed in different languages from around the world (2:44). Finally, a feature-length Audio Commentary is optional, along with a Deleted Song in storyboard form called “Warrior Face” (3:40), where Maui encourages Moana to get tough. Blood/Gore: Moana has a red abrasion on her ankle after getting her foot caught in the coral.